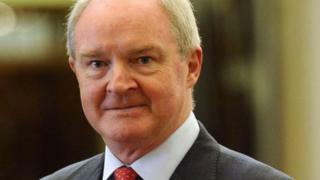 Northern Ireland's most senior judge has criticised the political deadlock at Stormont. The Lord Chief Justice said failure to pay compensation to victims of historical institutional abuse was an example of the negative impact of the lack of a functioning Assembly. Payments were recommended in 2017 but none have been made. Sir Declan Morgan described the lack of political direction as "a period of intense frustration". In January 2017, the Historical Institutional Abuse (HIA) recommended that compensation payments be made to abuse victims. But they have been told the inquiry's recommendations cannot be implemented without ministerial approval. In a speech to mark the opening of the new legal year, Sir Declan Morgan said the failure to implement the HIA recommendations was "indicative of the real impact a lack of government in Northern Ireland has on the lives of local people". Sir Declan added: "Implementation of the recommendations is urgent because in January 2017, almost 20 months ago, over a third of those who had engaged with the inquiry were over 65, a number had died and others were in very poor health. "Groups speaking on behalf of many of those who were in residential homes have made repeated pleas to have the recommendations implemented," he added. "Those pleas have been supported by all of the main political parties in Northern Ireland yet today those recommendations have still not been implemented and the human cost on those affected is increasingly severe." The victims' group, Survivors and Victims of Institutional Abuse (Savia), has previously described the argument that no action can be taken without ministerial direction as "ironic and insulting". The Lord Chief Justice criticised the fact that in the absence of a functioning Assembly there is currently no process within the current legal framework for civil servants to resolve "difficult and challenging disputes". "The provision of political direction to the machinery of government is a requirement of a functioning democracy," he said. "It is not an optional extra!" Sir Declan added: "This has been a period of intense frustration and I shudder to think what message it sends to the thousands of young people leaving our shores for university or work, people that we should be trying to attract back to populate our legal and other services."